Given the subject matter of identity and nationhood that lies at the heart of Yael Bartana’s And Europe will be Stunned and the way the trilogy explores the possibility of return and the dangers of nationalism and totalitarianism, the context in which I first came across the work – in the Polish Pavilion at the 54th Venice Biennale – was a fascinating one. It is unusual but not unheard of for an artist who neither lives in nor comes from a country to be selected to represent it at Venice and this was the first time Poland had been represented by an artist who wasn’t a Polish national. And, of course, the history of the Venice Biennale along with the architecture of the national pavilions, the positioning of them within the Giardini and factors like when different countries built or acquired their pavilions offers an interesting, albeit inevitably incomplete, picture of the politics of Europe in particular. Add to this the fact that in 2009 Poland was represented by Krzysztof Wodiczko, who left Poland in 1977 and has been a Canadian citizen since 1984, with Guests, a work about migration and the status of immigrants who remain forever ‘guests’ in their new homes, and the Polish pavilion becomes a fascinating, and intensely loaded, location for Bartana’s installation. 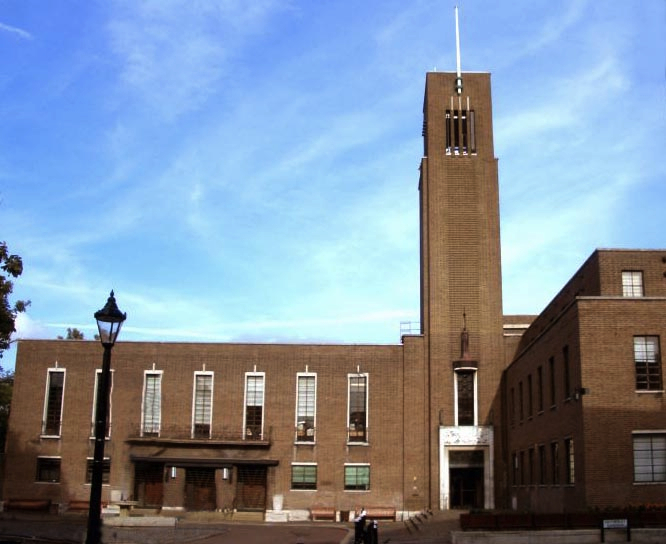 Hornsey Town Hall, designed by Reginald Uren and completed in 1935, was the first major Modernist public building in Britain. The combination of the style of architecture and the building’s original use make it a great location for Bartana’s trilogy. The first film is projected in a corridor. Sławomir Sierakowski’s speech can be heard from the entrance downstairs so to find the work on show in what is effectively a non-space is interesting in the context of the dilapidated stadium setting of the film and like Sierakowski’s audience, we must stand to watch him. In an adjacent room there is an archive of material gathered by Bartana; again this makes good use of the setting given that town halls and libraries often share space. The second and third films are screened in the council chamber. As we watch the building of the settlement and Sierakowski’s lying in state in the palace of culture, we sit in a space designed for debate and governance, albeit on a small scale. The surroundings, though designed with the Modernist imperative of form following function, nonetheless carry the signifiers of power. This is a formal space, intended for dialogue and presumably the scene of heated debate in its day. Perhaps ironically, in Bartana’s film Sierakowski has been assassinated not in a place such as this, where political decisions are take, but in an art gallery in front of a painting by Bruno Schulz, who was shot by a Nazi officer in 1942. 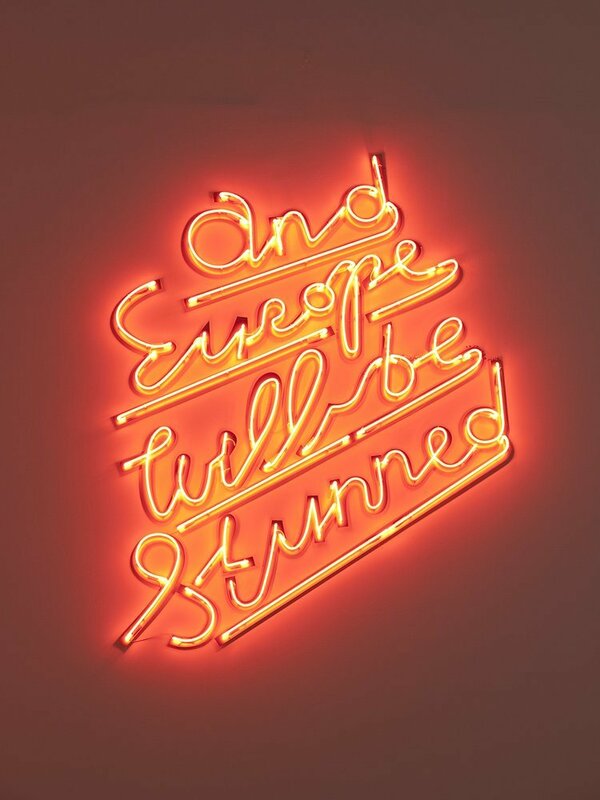 In both London and Venice the exhibition space used to show And Europe Will Be Stunned is a loaded one. In London, the choice of how to show the work within the Town Hall has been taken to maximise the relationship between work and space. In Venice the interior space was divided more functionally, driven by the necessity of catering for the a audience for whom each individual pavilion is inevitably a small part of a long day of art. Time-based work is problematic in the context of an event such as the biennale and I’m certain I’m not alone in not having had enough time to watch the work in its entirety there. Nonetheless it’s a work that has stayed with me in the intervening year and one which has grown in my memory, so that I revisited it in London with the conviction that I wanted to know it better tempered by the knowledge that this is a work that can’t ever quite be unpicked. 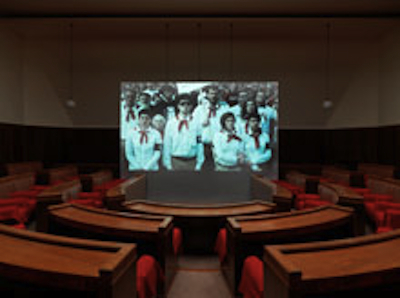 Yael Bartana’s And Europe Will Be Stunned is presented by Artangel at Hornsey Town Hall until 1 July. It takes about an hour to watch all three films; to watch them in sequence arrive about a quarter to (or even twenty to) the hour. 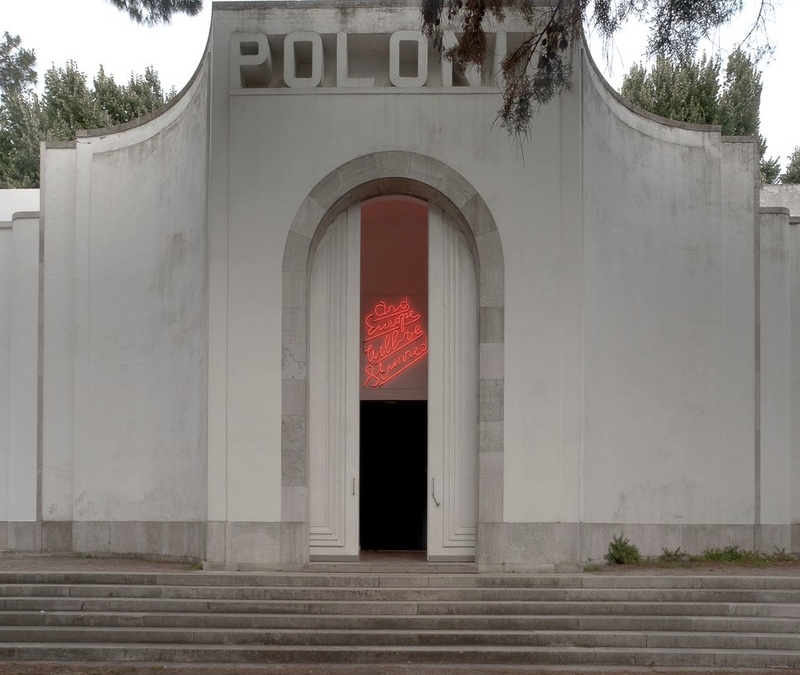 This entry was posted in Film/Video, Identity, Installation, Politics and tagged And Europe Will Be Stunned, art, Artangel, film, Hornsey Town Hall, Poland, politics, Venice Biennale, Yael Bartana by Ann Jones. Bookmark the permalink. I loved Yael’s videos. I saw them at the Venice Biennale and also at the Pompidou, and have one of her take-home Manifesto posters on my wall as a reminder/momento. At one stage Jews made up about 10% of the Polish population and lived in Poland for about 1000 years, so it is perhaps fitting that Yael Bartana was represented in the Polish Pavilion. I resisted the posters because I know I would never get round to putting them up – I have posters from other shows (certainly Felix Gonzalez-Torres and Ai Weiwei, and quite probably more) that amply prove this – and I urgently need to get rid of some clutter. Of course this means I quite wish I’d picked them up! And yes, it was absolutely fitting that Bartana represented Poland and, I think, even better that the piece was apparently shown in Poland at the same time.